I wanted to make a script which ran automatically on login so I put it into the file ~/bash.profile, but it didn't run. When I put it in bashrc, it ran on opening a terminal. What I was doing in the script was accessing a file in the pictures folder. I just added ./script.sh in ~/.bash_profile. How to make it run on login? 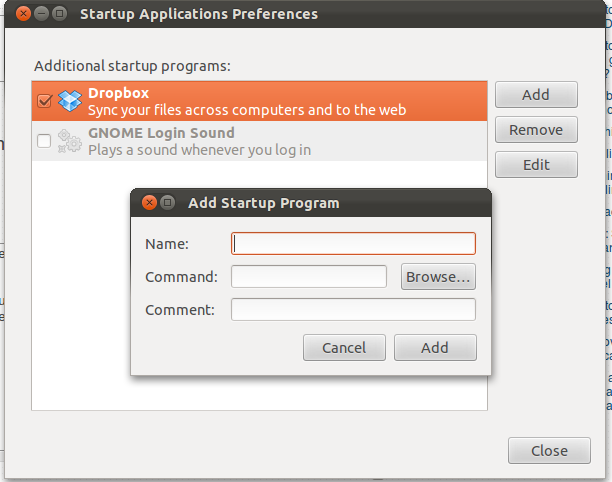 I'm using Unity on Ubuntu 11.10. .profile and .bash_profile are files that are sourced by bash when running as a login shell such as when logging in from the Linux Text console or using SSH. They are not sourced when loading a new shell from an existing login such as when opening a new terminal window inside Unity or other graphical environment. .bashrc on the other hand is only sourced for non-login shells, though sometimes distros will source .bashrc manually from within the default .bash_profile. 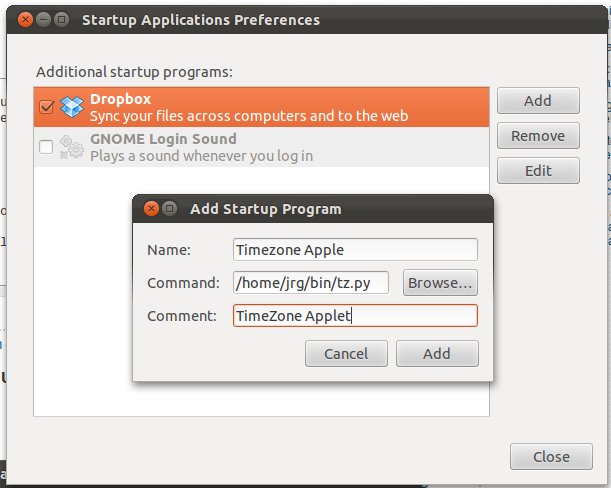 One workaround is to change Gnome Terminal to load the shell as a login shell from it's profile preferences, but then that would run every time you open up a new terminal window. Another option is to add it to the list of Startup Applications as suggested by @jrg. I'm going to paraphrase from another answer, but I'll include all the basics. You stated that you're using Unity, so search for and then open the program Startup Applications in the dash. Click "Add" and you should be all set! Not the answer you're looking for? Browse other questions tagged bash ubuntu login profile unity or ask your own question.